We have added Search functionality that will help you find cottages on our site. We have created several new websites FindMyDepartment56.com, FindMyLilliputLane.com, FindMyLladro.com, FindMyHummel.com, FindMyWillowTree.com, FindMyWilliraye.com, FindMyLemax.com, FindMyDisneyana.com and FindMyRoyalDoulton.com. These are search tools to help you find collectibles and what the collectible is worth. 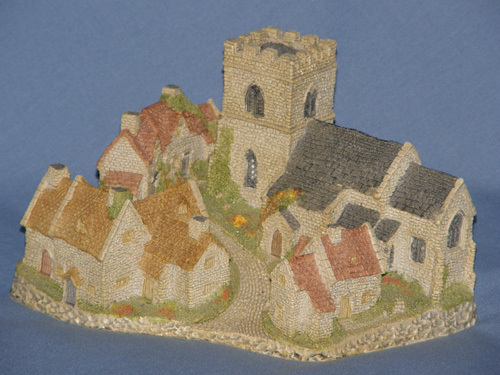 The Cotswold Village was my very first David Winter cottage and was given to me in 1987 by my husband. Our collection started there and grew quickly. In the late eighties, most cottages were sold in Hallmark stores or other little gift stores. My husband and I would spend weekends and evenings touring malls and plazas in the hope of discovering a hidden treasure of a retired cottage. Our collection grew to over 200 cottages each one special and unique. We even took a road trip and visited the International Exposition in South Bend, IN and met David Winter in person. Meeting him was a thrill and we got to talk to him about his cottages. David Winter was born in Yorkshire, England in 1958. He started creating cottages after meeting John Hine after he left sixth form college. They collaborated for 17 years after which he also had partnerships with Media Arts Group, Enesco and Friends of David Winter (FDW). David Winter officially retired in January 2010, and production of his cottages ended in 2012. Many thanks to David Winter for all the wonderful cottages he created. Some of our cottages belong to specific collections and we have tried to group them together as much as possible. Please click on the links or thumbnails to see our collections.